Chilton Manor Farm is a family farm and shop situated in the beautiful Kent countryside near Sittingbourne. Specialising in selling our own seasonally grown fruit and vegetables, supplemented by other local produce. We have fruit and vegetables ready to purchase from our farm shop or you can also enjoy the fun of picking your own from a selection of crops. 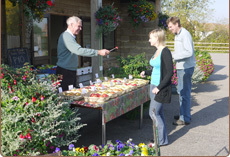 The farm shop is closed for the winter months and re-open mid to late May when the Strawberries are ready. Check back here for updates nearer the time.